The Truth About Green Drinks - Are You Afraid of Green Smoothies? So you’ve heard about green drinks or green smoothies, but you’re still not quite sure how you feel about them? It’s true, green smoothies aren’t exactly mainstream...not yet at least. It’s still not exactly normal to carry around a green drink. But more and more people are catching on to the amazing health benefits of green smoothies. Nowadays you can even buy a green smoothie at Jamba Juice! Still, I didn’t tell my coworkers about my green smoothies when I was first starting my green smoothie diet challenge. Not yet, at least. I didn’t want to come off as too weird too fast. It was only my second day at the company, and I didn’t want to scare people with my healthy eating habits. The good news is, there’s no need to broadcast the fact that you’re drinking a green smoothie if you don’t want to. It’s easy to keep a low profile. What I did was carry the green smoothie to work in a tall metal coffee mug. It wasn’t see-through, so no one knew that I had a smoothie inside. It could have been coffee for all they knew. I kept it in the office mini-fridge, and then poured a small portion of it into a Styrofoam cup every few hours. True, if they walked over to my desk and peeked inside, they might see a green-colored drink. But I was okay with that possibility...it’s still a lot more discrete than carrying a clear glass full of green shake. Want to Eliminate the "Green" Altogether? Here’s an idea if you really want to keep a low profile: frozen mixed berries give the smoothie a really strong purple color that overpowers the green color. So if you really want to be discrete, always include ample amounts of strawberries or mixed berries in your green fruit shakes. Just be warned that after a few hours of sitting in the fridge, for whatever reason the color tends to change and get greener over time. So what starts off in the morning as a dark purple smoothie could look green or even brown by the afternoon. Just something to keep in mind. 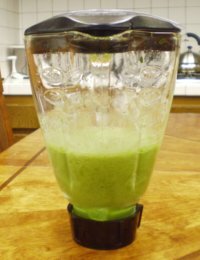 Are You Afraid of Green Smoothies? It’s one thing if your coworkers think it looks weird, but are you scared to drink a green smoothie? Regardless of the color, it still tastes delicious! Plus, it couldn’t be better for you! How do YOU feel about green drinks? Are you a green smoothie lover, or are you still afraid of them? Did you think they were weird when you first heard about them? How did you learn about them? What was your first experience with green smoothies? Do your friends and family still think you’re weird for carrying around a green drink? Share your story or experiences here! Tropical Frozen Mojito Smoothie – A healthy green drink that’s easy to love! Why Green Smoothies? - Learn more about the incredible benefits of these green drinks. 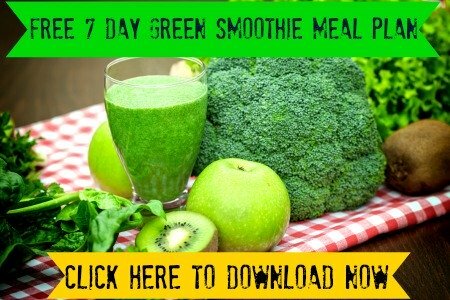 – Read about my one week challenge on the green smoothie diet.